I consumed it all in America this summer: wine, Mexican food, ice cream, hamburgers, chocolate, ribs, cakes, pizza, fries, Mexican food, beer, chocolate milkshakes, fried chicken, margaritas, Mexican food, and Mexican food. Looking at this sign, can one help but hear the thick, gelatinous, suction-y “scccchhhhlleeepppp!” the giant spoon makes as it levers out moist lumps of broccoli beef? 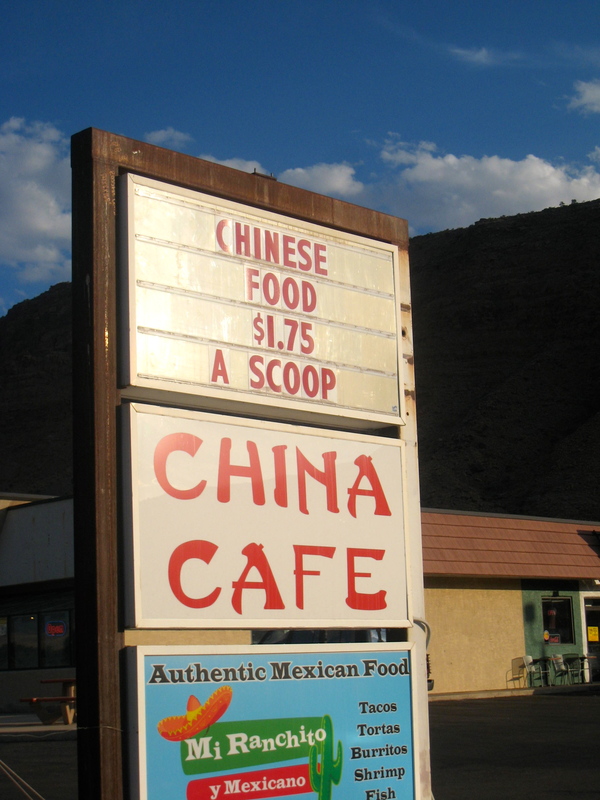 I pulled up along side the “China Cafe” only long enough to take this picture before motoring off to “Miguel’s Baja Grill” for tomatillo-laced Mexican food. Who is drawn to budget Americanized Chinese food in the middle of inland, small town American West? People who like value-priced, salty-sweet fat on top of refined carbs. Sometimes that’s me, but I prefer that flavor combination in the form of salty-tangy verde enchiladas with sweet-and-sour lime margaritas. Or in the form of french fries with a chocolate milkshake. Thrifty Chinese food lovers in America are similar to people who visit Pizza Hut in China: they enjoy eating hearty helpings of a localized version of a “foreign” food. A version that hyper-concentrates the salt-sweet-grease trio. Pizza Hut in Hong Kong features a pizza unknown in America. A pizza that substitutes the more traditional tomato sauce with creamy-sweet “thousand island sauce” and is topped with sweet corn, prawns, pineapple and cheese. Salt-sweet-grease in modified form. Those enjoying sweet-and-sour pork by the ladle in Moab, Utah are similar to the families I once watched at a Pizza Hut in Zhuhai, China: they are thrilled by the chance to stretch their dollar (or yuan) to the limit. Along with a pizza meal, one trip to the Zhuhai Pizza Hut salad bar was permitted. Each person was given a brown, modest-sized salad bowl. A bowl that many enterprising customers artificially enlarged by employing cantilevered watermelon wedges to create a rim that at least doubled the carrying-capacity of the salad bowl. 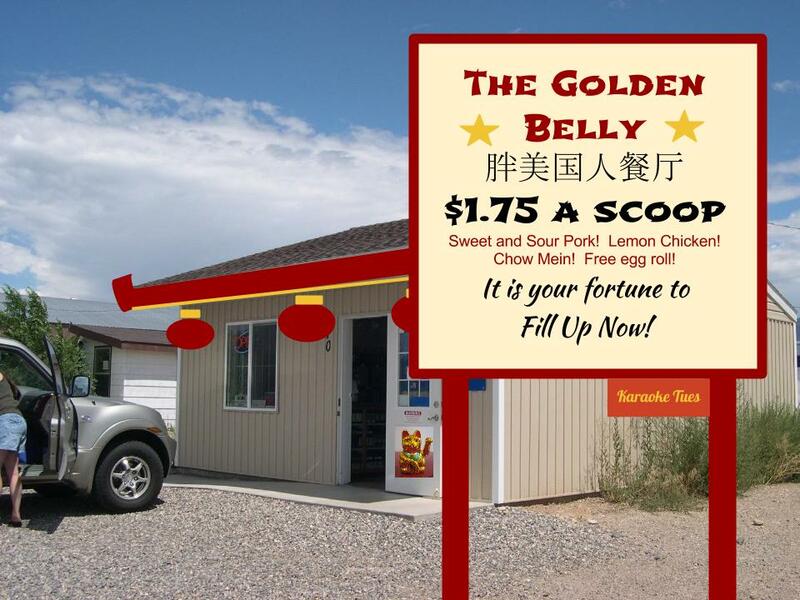 I have placed the fake “Golden Belly” sign in front of a real photograph of a liquor store in southern Utah. In the American state of Utah, one can only purchase alcohol (with the exception of 3.2% alcohol beer) in official State Liquor Stores (closed Sundays). 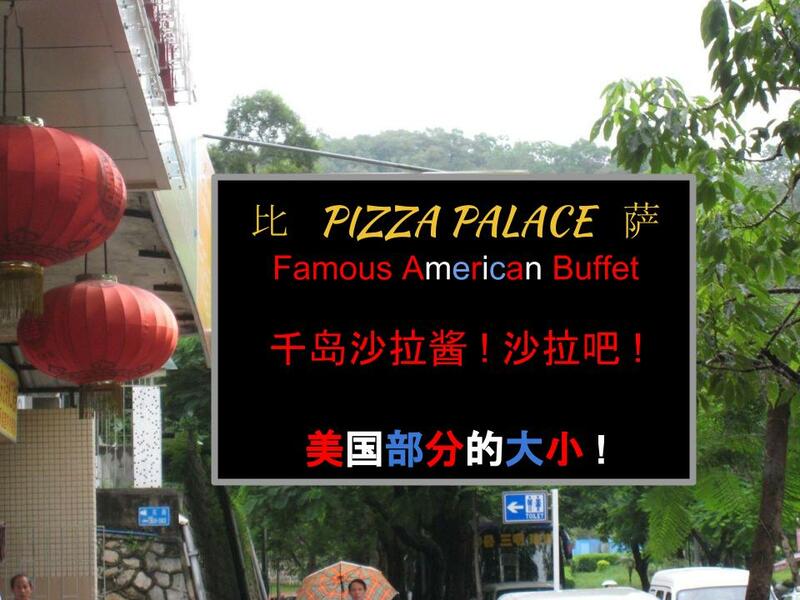 The fake “Pizza Palace” sign is hanging off of a random storefront in the Gong Bei neighborhood of Zhuhai, China. Please feel free to improve my Chinese. HAHAHA, you’ve designed the Chinese restaurant of my nightmares perfectly, complete with KARAOKE TUESDAY and red lanterns. Franchise opportunities with “The Golden Belly” are currently available. We’re particularly interested in franchisees able to exaggerate tasteless Chinese stereotypes. Contact me for further details. Thanks for liking my post about Javanese fig trees, Jen! Have you seen such an unusual tree before? Enjoying the natural splendor of Utah? Can it compete with the concrete trails of the New Territories?… actually, I’ve heard that Shaoguan has some good scenery, and you might even be able to take the HSR there, from Guangzhou that is. 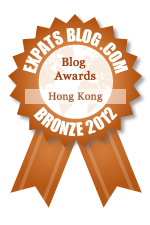 Also, do/did you generally like American-Chinese food before you lived in Zhuhai? I’ve never been a fan of it, though a few college friends made me go to a place in Springfield, VA (Dragon Sea Buffet) because the president of Palau once ate there. Here’s a good sound effect for the buffets: 扑通 pu1tong1, the sound of something falling in water. That twisted fig tree was pretty amazing! I used to go to eat Americanized Chinese take out as a child. My favorite dish was initially Lemon Chicken and later Wanton Soup. I’m in Seattle one more day before heading back to HK where I plan to indulge in a big Sichuan dinner. Have a good trip! Sichuan food is a good call. It’s probably not as easy to find that stuff in Seattle, but what is a treat is getting Ethiopian food. Your husband is spot on with his ‘Chinese’ font indicator! Too funny. I got over Mexican food while in Asia. I don’t even eat it now that I’m home! I must be a bit of an addict: I even make my own homemade corn tortillas in Hong Kong to get my fix! And I was overjoyed when I discovered that City Super carries Hernandez Salsa Verde. City Super is amazing! That’s one nice thing about living in Hong Kong — the availability of Western foods, even if they’re really expensive! I’m loving all your posts from this summer – your perspective on American traditions (eating and otherwise) are spot on every time! Glad you’ve been enjoying them! Six hours until our airplane departs and we’re headed back to Hong Kong. That is a great talk! I now remember watching it back when you posted about going to Canada to look for good Chinese food! The worst part of long haul travel is that you’re so happy to be going “home” but feel too crummy the first 36 hours to really enjoy being there. Thanks! The “American-sized portions” I ate all summer long have caught up with me! “It is your fortune to fill up now!” – Genius! This made me laugh a lot, yet also wonder just how many Chinese restaurants/takeaways around the Western world are “branded” just like this ha! It cuts a bit close to the actual truth, right? Glad you enjoyed it. Your scooping description is spot on! I admit, though, that I would totally try a scoop of just about anything for $1.75! Thanks for the laugh. When I saw the actual advertising sign that said “scoop” I almost died laughing.